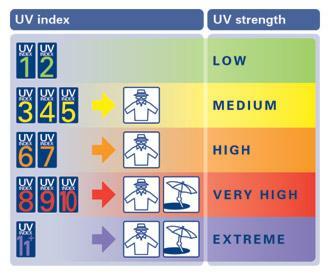 The UV Index provides a daily forecast of the expected risk of overexposure to the sun. The Index predicts UV intensity levels on a scale of 0 to 11+, where 0 indicates a minimal risk of overexposure and 11+ means a very high risk. Some exposure to sunlight can be enjoyable; however, too much could be dangerous. Overexposure to the ultraviolet (UV) rays of the sun radiation can cause immediate effects, such as sunburn, and long-term problems, such as skin cancer and cataracts. The UV Index, which was developed by the National Weather Service and the U.S. Environmental Protection Agency (EPA), provides important information to help you plan your outdoor activities to prevent overexposure to sun rays.